We ordered 1,000 YouTube Views from MediaMister to see if they could deliver their service as promised. We were very pleased with our order, which came just as expected and showed high audience retention. 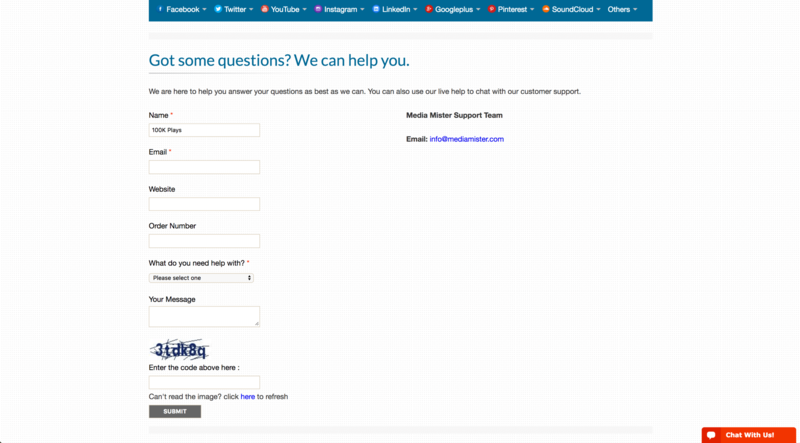 MediaMister also responded quickly to the questions we sent to customer support, and they have refund and retention policies in case anything goes wrong with your order. Overall we recommend the YouTube Views service of MediaMister if you're looking for ways to quickly and easily boost your social proof. They are a top-rated provider, and we recommend clicking the button below to visit their site for your needs. MediaMister is a social media marketing company based in Arizona, USA, and they've been operating since 2012. They have plans for quite a few different platforms, and tend to have detailed options that let you customize your bought social signals the way you need them. They have solid customer protections and good customer support as well. 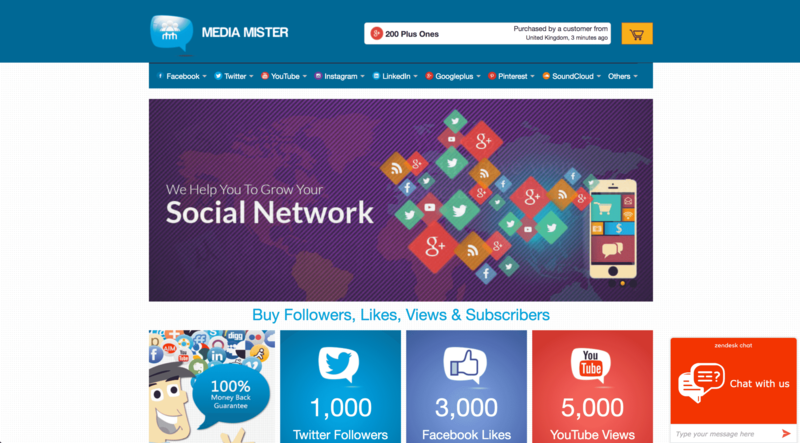 MediaMister can help you out with bought social signals for YouTube, Instagram, SoundCloud, Twitter, Facebook, and more. 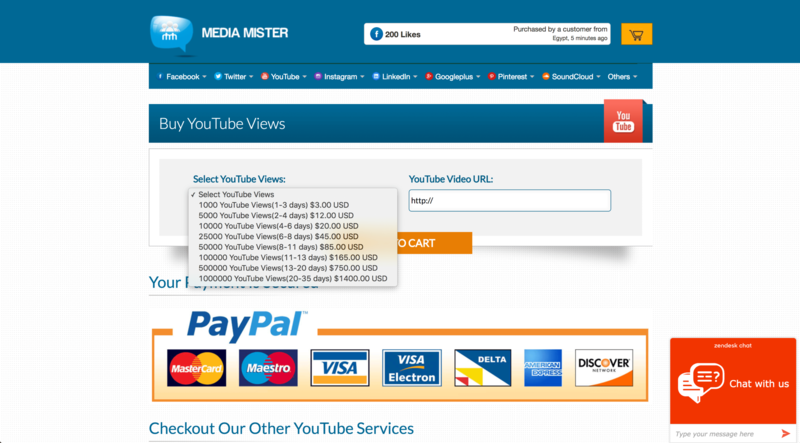 For YouTube, MediaMister offers a variety of services. You can buy Views, High-retention Views, USA Views, Likes, Dislikes, Subscribers, Favorites, Comments, and Shares. Pretty much everything you'd ever need on this platform. We reviewed the terms and conditions sections on the MediaMister website and made a few comments on their status below. To find out more details on these, then please toggle the sections to see what we thought! Your personal information is kept confidential. They will never sell it to other service providers and advertisers. If your order is not completed on time as promised, you can get all of your money back. MediaMister offers a 30-day Retention Guarantee for all their services. You'll find a few different ways to get in touch with MediaMister. We've had issues with their on-form contact page, so we recommend you use their email address if you want to send them a message. Before we ordered, we like to send some questions to test the company's customer support. As you can see, MediaMister responded to our questions fairly quickly, with informative answers laid out nicely. 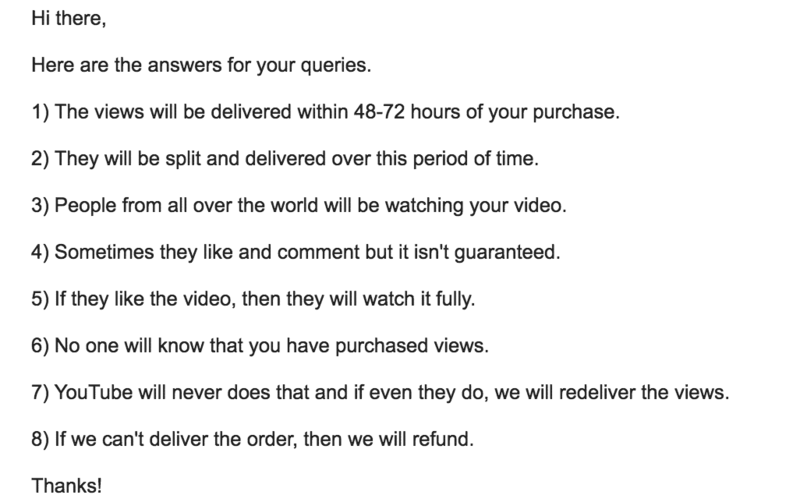 "1) The views will be delivered within 48-72 hours of your purchase." "2) They will be split and delivered over this period of time." "3) People from all over the world will be watching your video." "4) Sometimes they like and comment but it isn't guaranteed." "5) If they like the video, then they will watch it fully." "6) No one will know that you have purchased views." "7) YouTube will never does that and if even they do, we will redeliver the views." "8) If we can't deliver the order, then we will refund." After our order finishes we send another set of questions, testing to see if their customer support treats us any differently as paying customers. As you can see, they responded with some clear answers to our questions. "The views will not be removed at all." "Sure. Use the coupon [removed] while placing your next order to get 10% discount." "If they like the content of your video, they will certainly add likes and comments." "Your account will never get into trouble for using our services." We recommend the services of MediaMister to anyone who wants to improve their reputation on YouTube. Based on our test, nobody would be able to tell that you bought Views. Our Views began arriving very quickly, the same day that we ordered them. Most of our Views came that very day, and the order finished up the next day. Our Views came mostly from the Netherlands, with a scattering of many other countries as well. As you can see, the audience retention was very high at 95%, showing that the viewers watched almost the entire video on average. The Views we got from MediaMister have stuck around, with no losses. Overall we were very happy with our order of 1,000 YouTube Views from MediaMister. They came very quickly and we got almost 200 extra for free. Their customer support answered our questions soon after we asked them, responding with some good information, and their refund and retention policies are top-notch for sites like these. We can easily recommend the services of MediaMister to anyone who wants to boost their reputation and social proof on YouTube with bought social signals. My views were delivered same day i ordered for them. The quality was unbelievably amazing especially for the price i paid for. My order of 2000 views came in on time with an extra 460 views. The retention rate has been a perfect 100% so far. What more can i ask from them? I ordered for 2000 viewsand in less than 16 hours I got 2400 views delivered meaning i got 400 extra, what a brilliant gesture from them. Good customer support is always a precursor to the kind of service you will get, at least that has been my experience. The customer support at mediamister is top notch and the views i got after a very pleasant conversation with one of their reps were of high quality and were delivered in time. I ordered for 1000 views and by the time I was going to sleep 8 hours after ordering I had all my views. The retention rate is amazing as well. Will definitely use them again. One of the commendable things about media mister is their audience retention all the followers they brought in are intact and the number is growing, am convinced the followers are organic now. I recently got a boosting package of YouTube views from Mediamister and my channel which was relatively dormant has responded quite well, with notable growth in views. The YouTube views I ordered were added onto my two videos in good time and expectations were met. My testimony is on the good quality views they delivered for my YouTube channel. The views I got had been delivered overnight and in a span I never thought was possible. I loved the speedy delivery.